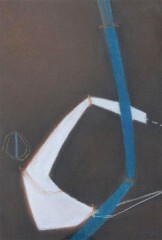 An Irish abstract-minimalist painter. Born Rathdrum County Wicklow, Ireland. King was a successful business man who developed a significant collection of contemporary art. In his mid-thirties he began to paint, holding his first solo exhibition in 1959. Cecil King became a full-time artist in 1964, the same year that he won an award at the Arts Council of Northern Ireland´s Open Painting exhibition. Initially he worked in a semi-realist style, as seen in a number of lyrical paintings and pastels known as the Circus series which were influenced by artists such as Nicolas de Staël and Roger Hilton. King was a founding member of the Rosc exhibitions, and through this involvement met important figures such as Barnett Newman whose work influenced his artistic development. In the early 1970s he began the paintings known as the Berlin series – large scale colour field works in which a narrow peripheral band creates a tension between figure and ground. In these meticulously executed canvasses King made economical use of simple elements. A series based on his oils were published by Editions Alecto, London in 1971 as a set of 6 screenprints. Needless to say, his work is held in many public and private collections. Cardiff, Howard Roberts Gallery, 1967. Belfast, Arts Council Gallery, 1967; Octagon Gallery 1972. Edinburgh, Richard Demarco Gallery 1967. Leeds, Queen Square Gallery, 1968; Park Square Gallery, 1973.